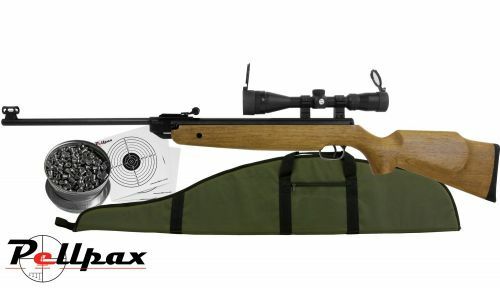 XS 20 .22 Air Rifle, Hawke Vantage 3-9x40 Scope & Hawke Two Piece Mounts, Quality Fully Padded Soft Case, a tin of .22 Pellets & pack of our targets. The Rifle is a class act on its own, it is a Full Legal Power Limit .22 Spring Powered Break Action Rifle, it has Brilliant Accuracy and Superb Finish to the Action and Woodwork. The Trigger is fully adjustable for weight and handling is very good. 3-9x40 Zoom Scope and Top Quality Two Piece Mount to compliment a 1st Class Rifle. Quality Soft Rifle Case also included, the complete package. Each individual rifle has its Scope fitted and zeroed by us before dispatch ready to shoot straight from the box, We also include a tin of pellets and pack of targets. Add this item to your basket & spend an extra £265.01 to apply for finance.